Public transportation, by virtue of the number of riders in each vehicle, always has been “greener” than individual drivers relying solely on automobiles for their transportation needs. The Milwaukee County Transit System (MCTS) has attemptedover the years to improve all of its operations, both on the road and behindthe scenes, as far as the environmental impact. And I’m happy to report that recentMCTS modifications have made our local public transportation system even more planet-friendly. This year, leading up to Earth Day on April 22, MCTSwill offer free rides on all routes on Thursday, April 21, from the beginningof service all morning until 9AM. The Miller Lite Free Rides promotion is donein conjunction with MillerCoors. In 2010, we saw the addition of new, clean diesel busesto the MCTS fleet. If you have been on one of these new buses, you know theyrun much more quietly than the older models. If you have been outside the buses as they drive by, you know they don’t stink! Well, hardly at all. You can identify the new buses in two ways, either by the sizeable “bump” on the top of the bus near the front or by the solid blue color with green and gold highlights. The older buses are white on the bottom half. The entire MCTS fleet uses ultra low sulfur diesel fuel, catalytic converters, low horsepower engines, high efficiency transmissions, brake retarders and low profile radial tires – all with the goa lof increasing gas mileage and reducing harmful emissions. Selective Catalytic Reduction is the technology used in the new buses to further reduce the carbon footprint of the transit system. That technology results in clean, near-zero emissions exhaust. Nitrous oxide, fairly prevalent in exhaust, is a harmful green house gas that contributes to global climate change. The new bus engines inject Diesel Exhaust Fluid into the exhaust stream, which converts harmful nitrous oxides into harmless nitrogen gas and water vapor. Over the last two years MCTS has added a bike rack tothe front of every bus in its fleet. The racks hold two bikes and are easy and quick to use. This feature has expanded non-car transportation options for a good number of folks, especially those who live a fairly long walking distance from the closest bus stop. Even during the heaviest snowstorms this past winter, bike riders could be seen braving the weather to put their bikes on the racks and seek the warm, dry environment inside the bus. Ten Ford Escape Hybrid vehicles have been added to MCTS for use by route supervisors. The maintenance facilities for the bus system also are very conscious of their impact on the environment. Many of the parts and chemicals used daily in the garages are recycled, including motor oil, Freon,antifreeze, batteries, plastic windows and scrap radiators. In the Body Shop at MCTS, low VOC (Volatile OrganicCompounds) paints are sprayed using a high volume/low pressure method to get more paint onto the bus and less released into the air. Even the print shop, which prints the transfers and route schedules, uses environmentally friendly chemicals with low VOCs. Whenever possible, recycled paper is used, especially for the thousands of printed schedules. MCTS estimates that the 46 million passenger trips i tprovides each year save 54,000 tons of CO2. And, finally, the transit company asserts that one of the biggest cuts you can make in your household’s carbon footprint is by switching to public transit – as much as 4,800 pounds per year compared to a car! The bottom line, though, is that no amount of green technology or planet-friendly policies will work if people insist on staying in their automobiles. The Transit System here long has suffered from a kindof “Catch 22” approach to funding and scheduling decisions. The fewer riders on each route this year, the more that route is going to be cut in next year’sbudget. But, why are there fewer riders? Could it be because the route was cut severely the year before? In other words, if you run them (the buses), the riders will come. But the elected powers-that-be, both locally and in Madison, have to want to run the buses. And there’s the hitch. One meaningful way to celebrate Earth Day on April 22– and every day – is to utilize the pretty-darn-good public transit we’ve got here in Milwaukee County. 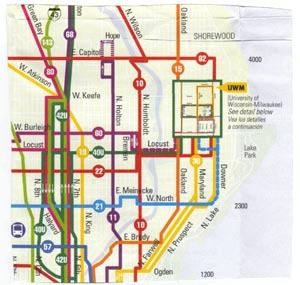 Riverwest is lucky to have excellent coverage with anumber of routes serving the neighborhood. Check out the area map accompanying this article to see how convenient it is for virtually anyone living inRiverwest to get onboard. If you are reading this in time, and you’re already a fan of public transit or you’d like to learn more about the funding situationfor MCTS, the Coalition for Advancing Transit is holding a public meeting onThursday, March 31, 2011, at 6:30PM. The meeting will be at Independence First,540 S. 1st St., conveniently located on Route #15. Or, visit ridemcts.com to plan your trip. At the MCTS site, you also can link to the Google Transit Trip Planner for any destination and time you want to travel. Transit map as a pdf, click on the link below.